Christopher Kane’s SS 10 Collection introduced us to the modern gingham. I love the candied baby blues and pastel pinks combined with the more wearable navy and beiges. 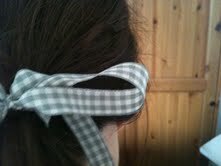 I am starting to bring in small amounts of gingham into my accessories now with some ribbon casually tied into a low pony. It should look like you’ve been rolling around in a the hay….maybe at a Chanel hoedown. Ribbon £3.50 for 3 metres from a selection at John Lewis.